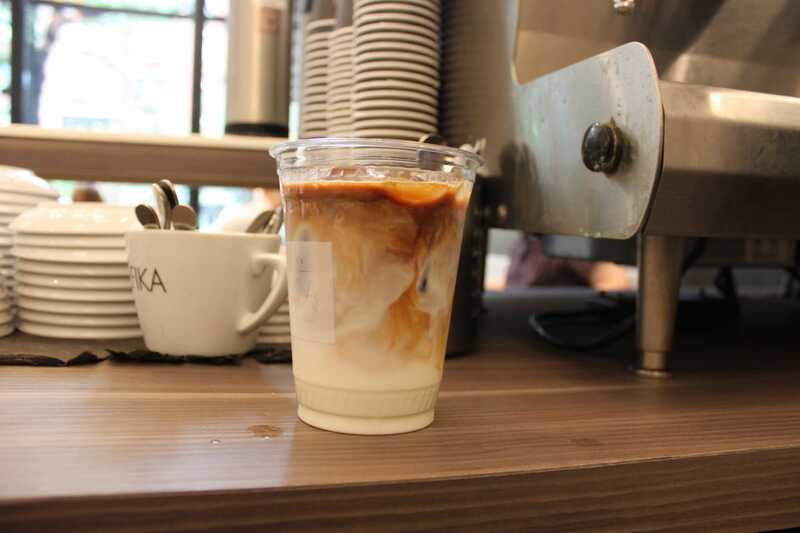 Fika, a Manhattan-based coffee chain, wants New Yorkers to slow down. At the headquarters on 55th Street, people chat with friends over plates of chocolate and tiny cups of espresso. Other customers sit in “Mad Men”-esque chairs and type on laptops, soaking up Fika’s free Wifi and Scandinavian design. The scene is a startling departure from most NYC coffee shops, which rush you through the line and out the door. Some even have time limits for how long you can sit. But Fika doesn’t mind if you linger — in fact, the shop encourages it. The company’s name is a nod to the Swedish word, “fika,” the daily ritual of taking a break from work, usually centered around coffee, sweets, and friends. Akerlund emigrated to the US from Sweden in 2005, and founded Fika a year later. The coffee chain will celebrate its 10-year anniversary this year, with 17 locations spanning from Manhattan’s southernmost tip to 89th Street. Starting later this year, the company plans to expand to five more cities: Washington DC, Philadelphia, Boston, Miami, and Chicago. 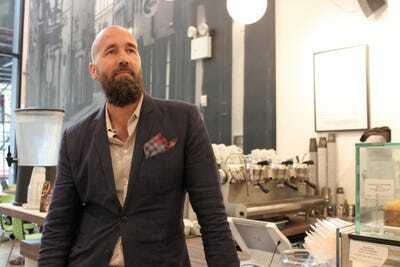 Eventually, Akerlund wants to expand Fika globally. He describes his experience as the epitome of the American Dream, but it hasn’t been any easy journey. When he wanted to launch Fika, he tried (and failed) to convince over 70 Manhattan building owners to let him start the business. 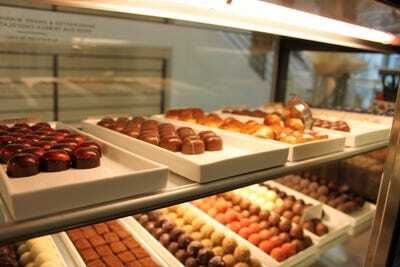 Only one owner at 41 West 58th Street, Fika’s first location, took a chance on him. By the end of the first day, Akerlund had $247 in his personal bank account, using most of it to launch the store. Fika charged $2 for a small cup of coffee, which was expensive for 2006 (Akerlund recalls a man’s baffled reaction to the price: “Why would I pay over a dollar for a cup of coffee?!”). At first, it was hard to convince customers to buy expensive coffee, because it wasn’t considered an art form like it is today. When coffee first hit American shores and the country entered the first wave of coffee culture , it was mainly thought of as merely something to wake you up — never mind how it tasted. 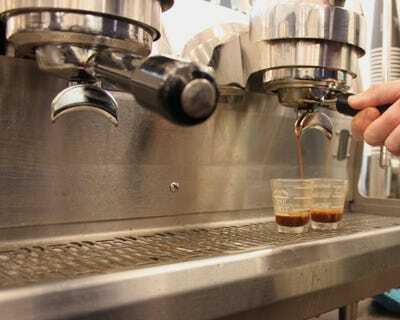 Around the late 1980s, Starbucks (inspired by European espresso culture) pioneered gourmet coffee culture in the US, kicking off the second wave and charging higher prices for specialty drinks. Then, near the beginning of the millennium, coffee shops moved toward even more expensive, higher quality brews. Known as the third wave, baristas started concentrating more on the beans’ origin and pored over latté art. Fika opened a few years into the third wave, and people were still warming up to the idea of $2 cups of coffee. But once people started to equate Fika’s espresso and coffee with quality, they didn’t mind paying more money for it, Akerlund says. 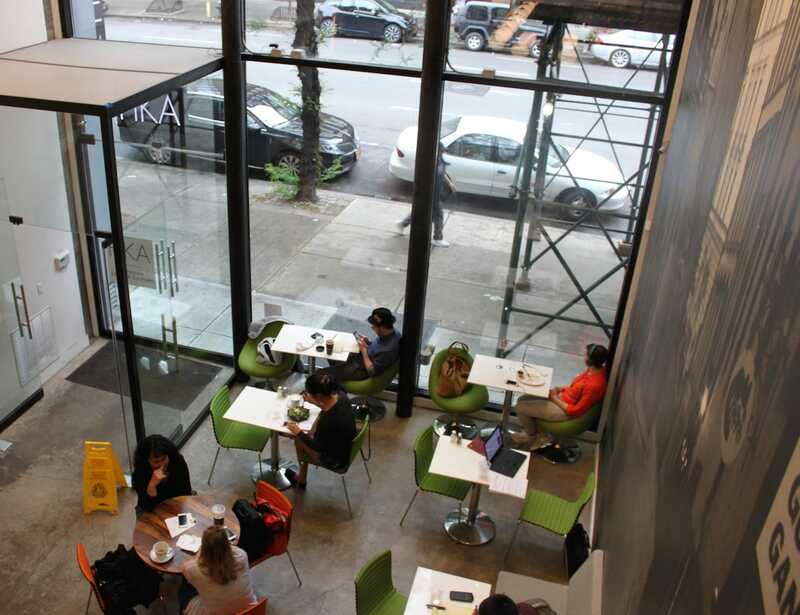 Now, Fika, which charges upwards of $4 for a latté, is taking over Manhattan. Fika’s 5,000-square-foot, two-story headquarters opened in 2014 and is the company’s largest location. When you walk in, you immediately see a giant black-and-white photo on the wall (taken by Akerlund) of a street in Sweden. He has picked out every design detail in the shops, including the furniture, lights, and paintings. The slender chairs, tables, and booths are throwbacks to ’60s and ’70s Scandinavian design, characterised by minimalist forms and pops of colour. Wallpaper featuring illustrations by Swedish artist Josef Frank lines the bar upstairs. While Fika follows a Scandinavian aesthetic, everything in the stores — from the tables to the floor polish to the milk — is made in the US. For example, Akerlund is friends with the dairy farmers that deliver the shops’ milk, and the company buys an organic detergent from a company in Queens. The idea is support other homegrown businesses. Akerlund also knows many of the people who farm Fika’s coffee plants in places like Tanzania, Ethiopia, and Kenya. 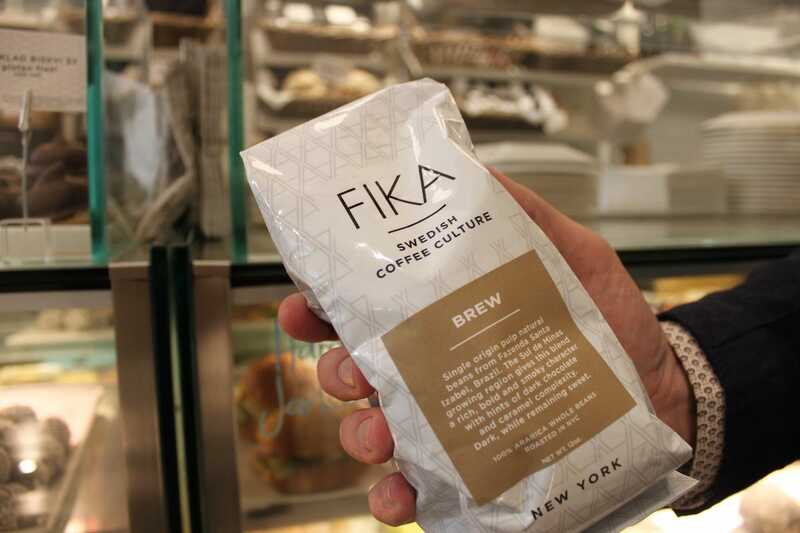 The coffee chain’s beans are roasted nearby in Brooklyn, so they’re still fresh when they arrive at Fika’s shops. 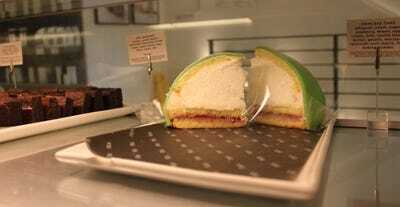 “It’s more expensive for Fika, but it’s worth it,” he says. The food, which is only made by 12 chefs total for all 17 locations, is delicious. The company makes all of its lunches and pastries in its headquarters and then transports them to the other locations, ensuring they’re still fresh when they reach the customer. Only two or three people work in the headquarter’s kitchen and bakery at a time. In one day, chef Dean Morrison says he makes up to 400 pastries. 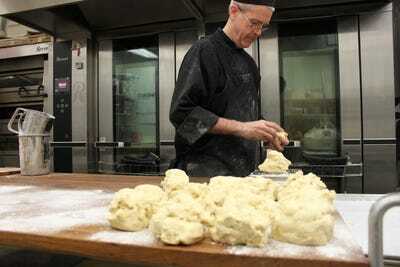 When I visited, Morrison grabbed handfuls of dough from a 30-quart metal barrel. He then moulded them into balls to make orange snitt, a Swedish pastry. In the basement, employees prepared wraps and salads to be distributed to the other locations. Akerlund attributes Fika’s culinary success to the fact that the Swedish recipes are handmade with local ingredients. For example, to make a “Princess Cake,” Morrison sculpts layers of raspberry jam, vanilla cream, whipped cream, marzipan, and sponge cake, forming it into a half-sphere shape. This take a long time, he says. Besides its coffee, the chain is known for its batches of homemade chocolates, which head chocolatier Håkan Mårtensson makes in Fika’s Tribeca factory. Sometimes, he carves life-size chocolate sculptures and shows them off on Instagram. It’s important for Fika to have a physical hand in its chocolates instead of using machines, because that’s what the store is known for, according to Akerlund. When customers buy a box of chocolates, they know that Mårtensson made it with his own hands, giving the transaction a personal touch. Hand-making its chocolates also relates back to the fika attitude: slower is not only ok — it’s better. The only part of the process that the company wants to automate is the wholesale packaging, which would save time, he says. As American coffee culture enters its fourth wave — characterised by family-owned shops’ ventures into global expansion — Fika wants to ride along. Akerlund hopes to follow an expansion strategy similar to Apple’s, where cities have one flagship location accompanied by smaller satellite stores. Fika currently employees around 160 people (which Akerlund calls a “lean machine”), but the plan is to slowly grow. Fika’s next challenge, like many coffee chains that are trying to jump outside its home city and eventually overseas, will be to retain its fika ethos and practice of only buying US-made supplies. Starbucks, which has allegedly violated labour laws, evaded UK taxes, and served low-quality coffee for what it charges, has experienced trouble with this. Even if Fika has the best intentions, keeping the shops’ fika tradition alive could be tricky. It’s hard for brands to slow down as they grow larger.